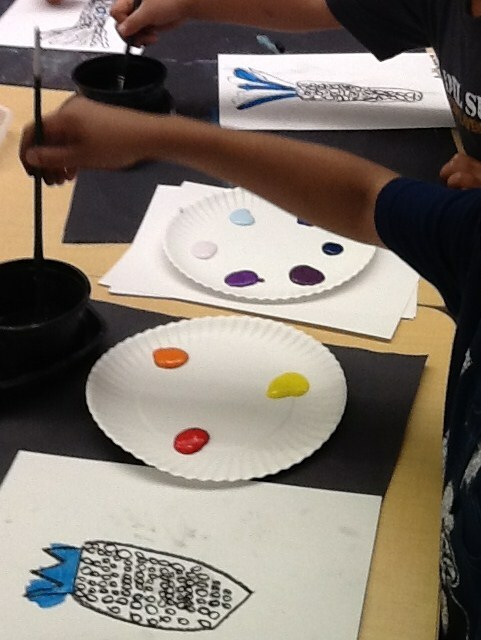 Students in grade 2 learned about warm and cool colors and tints and shades. I saw a similar image on Artsonia a while back and tried to find it but could not so I have no idea who originated this lesson. 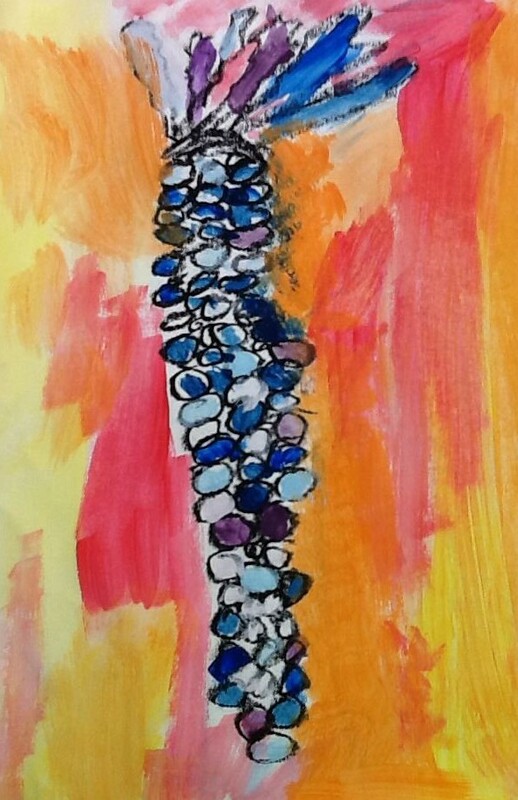 Students first drew an ear of corn with the husks at the top in black oil pastel. They filled in with each kernel using cool colored paint that was pre-mixed. 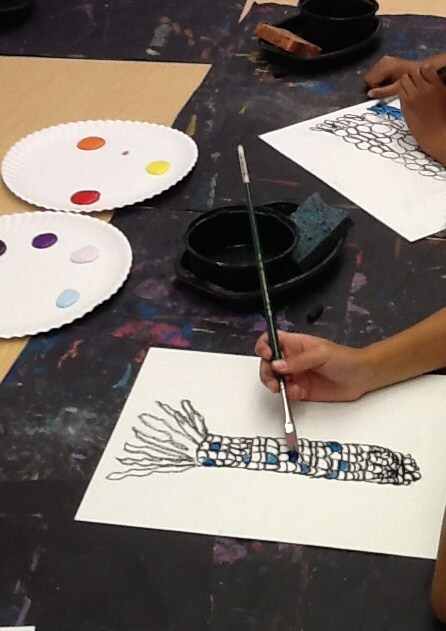 We used tints and shades of blue and purple for the corn. 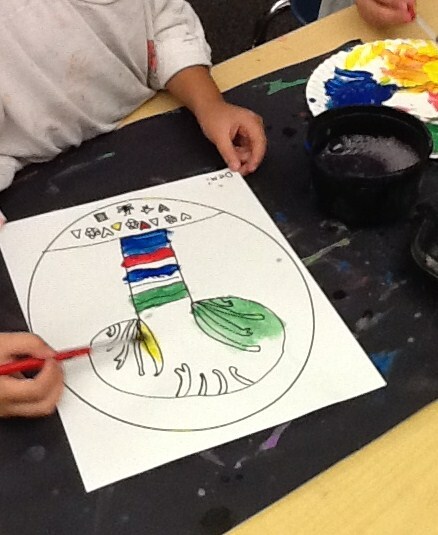 When the corn was finished, the students painted the background using warm colors. 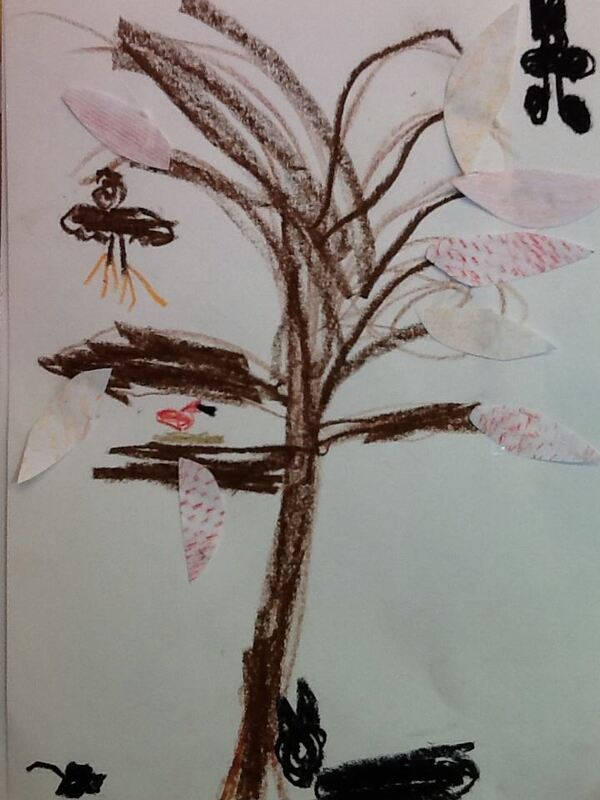 Grade 1 studies owls in the fall. The classroom teachers do a large unit on owls which culminates in an owl visitor coming to our school through a wildlife rescue organization. 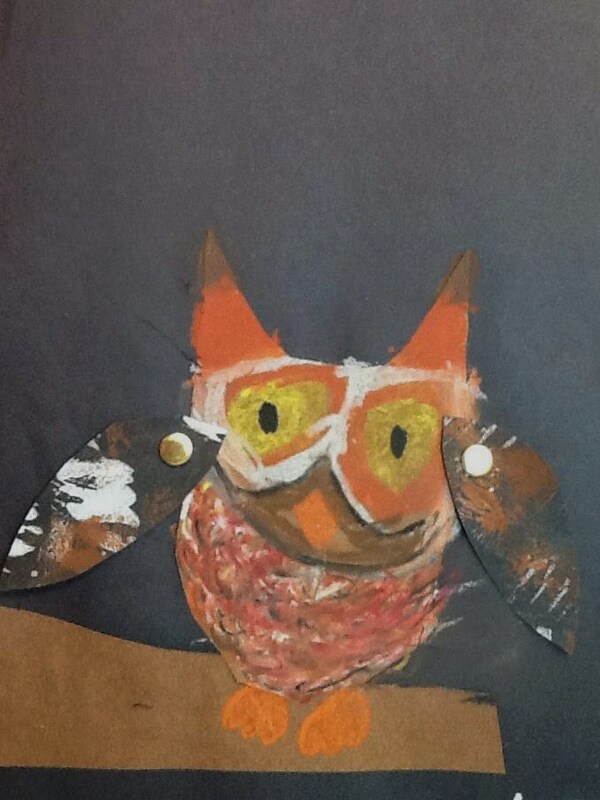 For this lesson, students chose their owl (body) paper-I had two shades of brown and white pre-cut into rectangles for them. 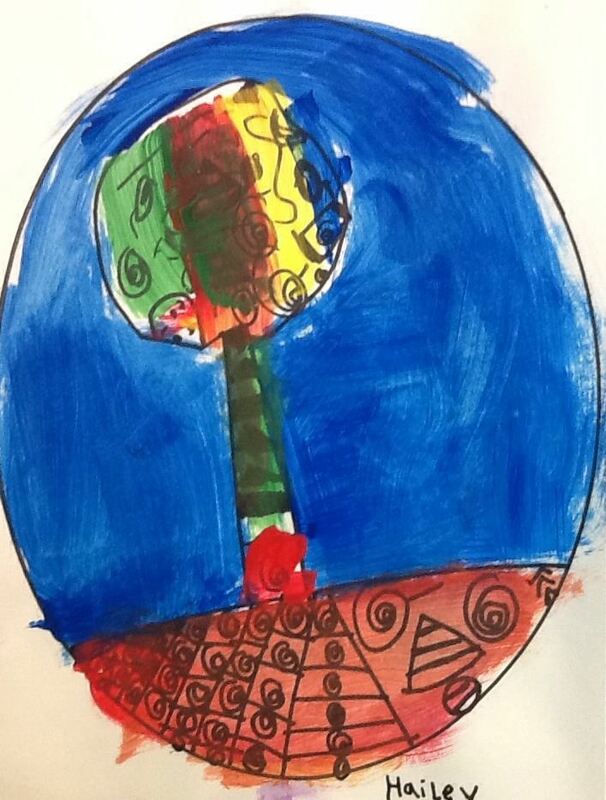 They then drew an owl shape-basically an oval or an oval with a squashy “U” if they wanted the eared variety. They cut it out, glued it onto black paper and added a branch. They decorated the owl however they decided it should be. It could be realistic or imaginary. 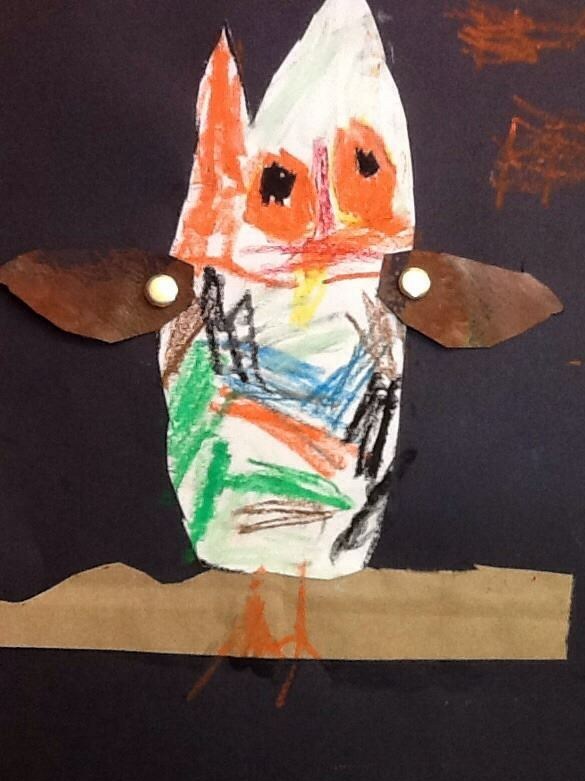 Once their owls were complete, they added wings cut from painted paper. I did most of the wing attachment as most do not have enough dexterity yet to push the brads through the paper and bend then back without difficulty. If behavior is any indicator, I think that this lesson was a hit. 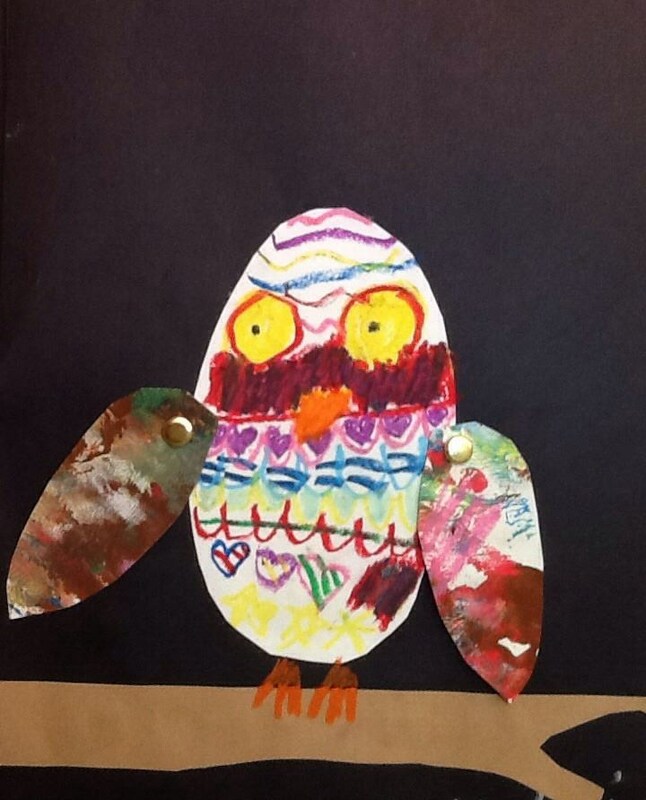 We had many owls “flying” in the art room today as they made their way to the drying rack. 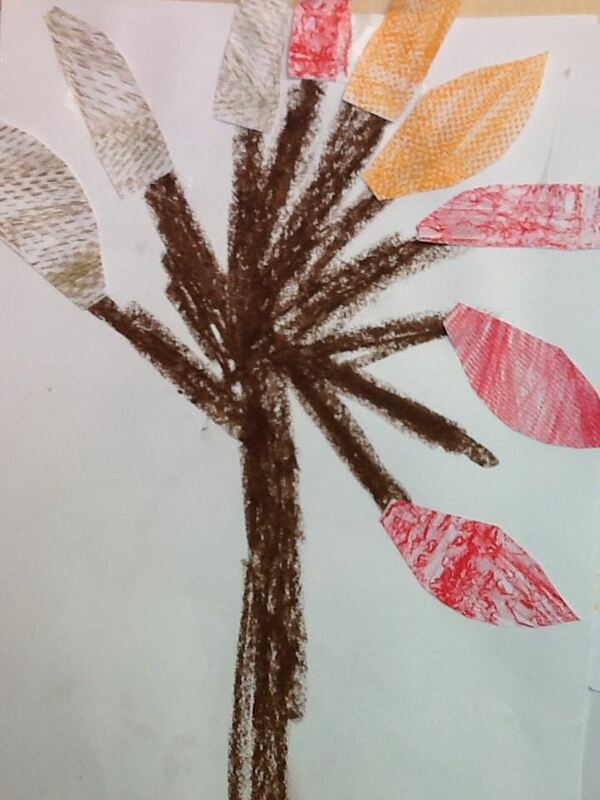 The K/1 students drew trees in crayon then used the texture plates today to create leaves for fall trees. They first colored small squares of paper using the texture plates. Once complete, they cut out leaf shapes. They then glued them onto their trees. They could add grass , sky and other things if they wanted to but only a few did that. If I were to do this again, I think I would use colored paper rather than white. I love how different they all turned out. A tri-fold project done by a student is where I got the idea for this lesson. 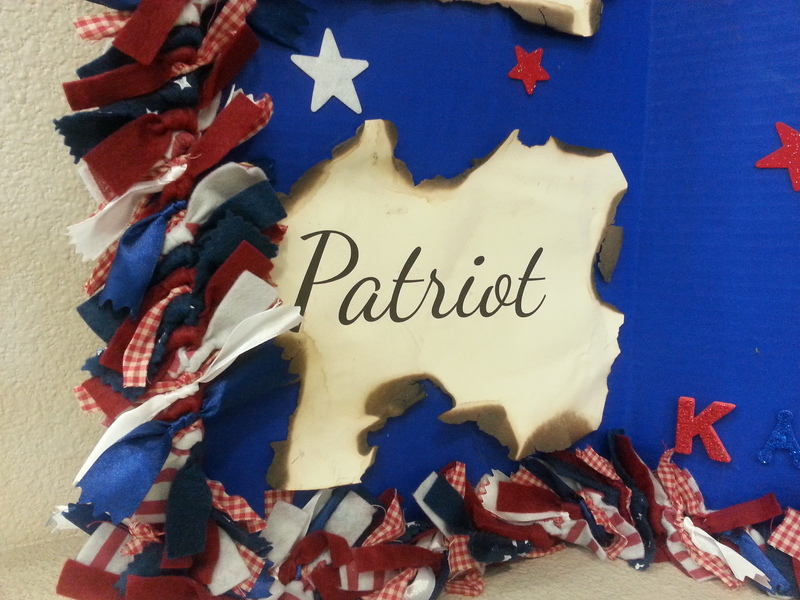 In the hallway of our school is a tri-fold board with the word “patriot” on it. I see it every day as I leave the staff room. 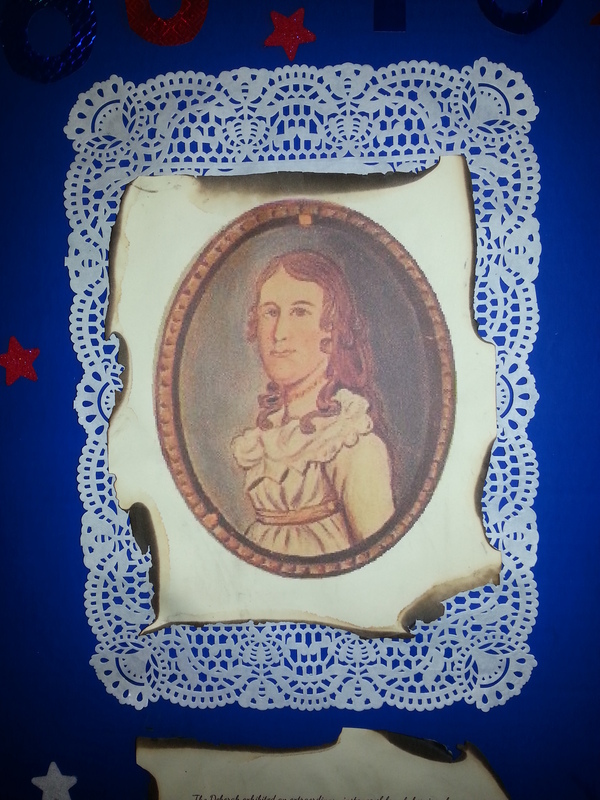 For this lesson, students drew a self-portrait in chalk pastel as if they were an early American patriot or colonist. 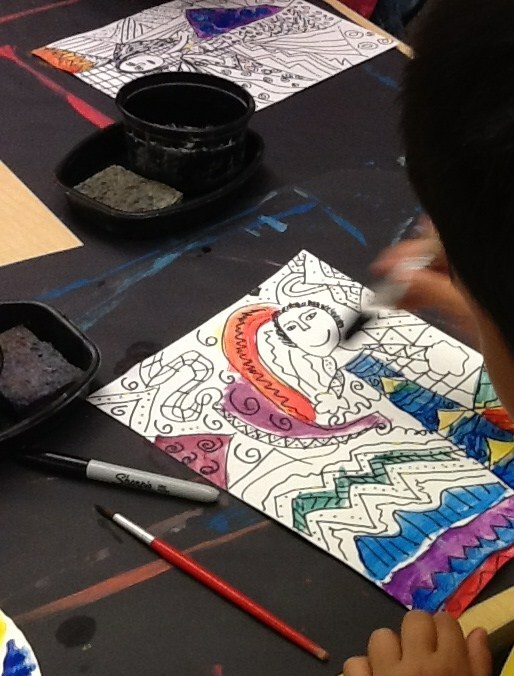 Students in grade 5 learned about John Copley and Charles Peale both portrait artist during our country’s early years. The students looked at portraits by these artists as well as pictures of colonial clothing, hats and wigs. We talked about the basics of facial proportion, eye shape, drawing hair, etc. Many of them have done self portraits with me in the past so it was review. For those who have not had me for art, I spent time as I could with them individually. The kindergarten classes learned about lines and shapes for this lesson. We talk about how a line is just a dot that takes a walk. Students were given basic directions on how to draw a bird. I allow a lot of freedom so if they had an idea for a bird, they were free to draw it their way. The beak could be straight on or off to the side, the bird could be tall, short, wide or thin. I allow them to make many choices as we create art. 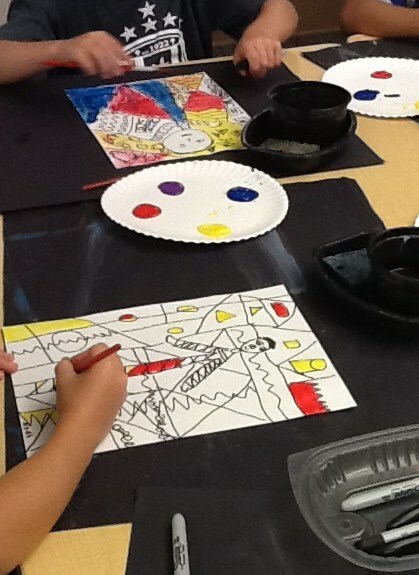 It keeps them engaged and allows them ownership over the art project. We then talked about lines. I demonstrated how to draw the different types of lines and they could put the lines wherever they wanted to. 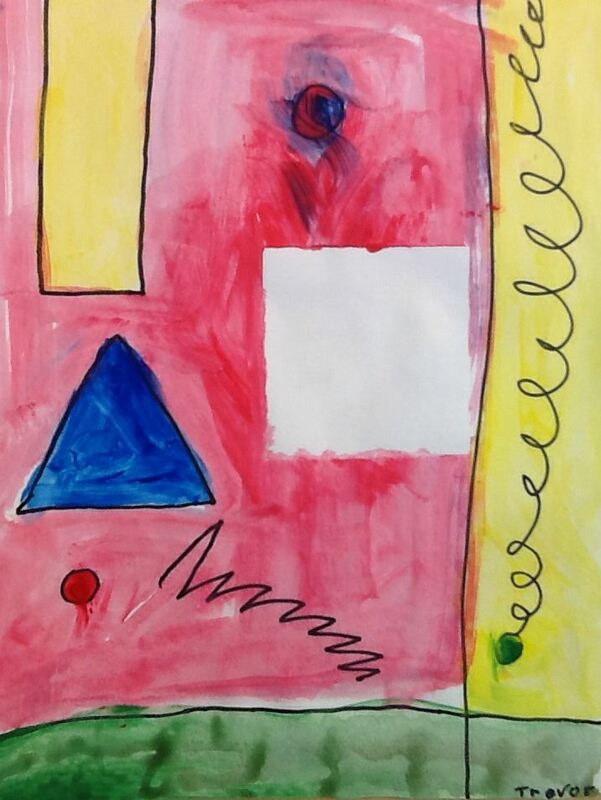 Loopy lines, curved lines; straight lines, thick lines, thin lines, angles or zigzag lines. Then they added shapes-squares, circles, triangles and rectangles. 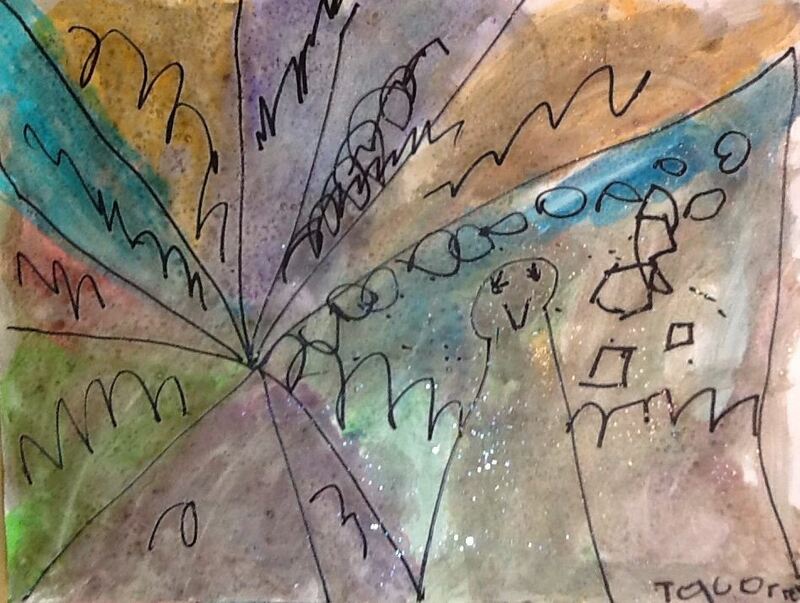 Once they finished the drawing, they painted with our donated glitter paint. 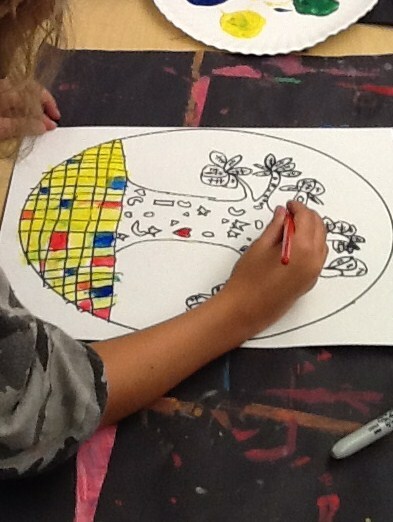 Second grade students learned about Austrian artist Gustav Klimt (1862-1918). They looked at portraits by Gustav Klimt today. His portraits are interesting with their simple faces and complex patterns. 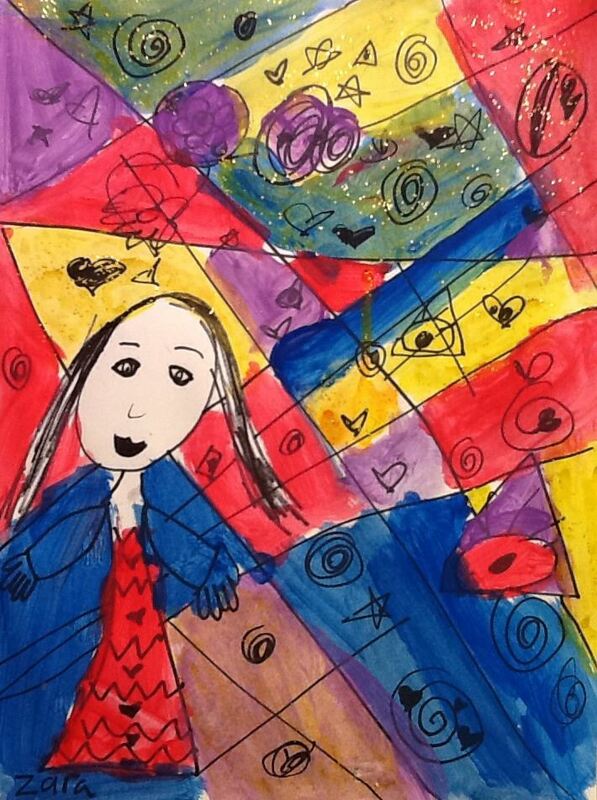 Students were directed to draw their own face. They could add hands if they wanted to. 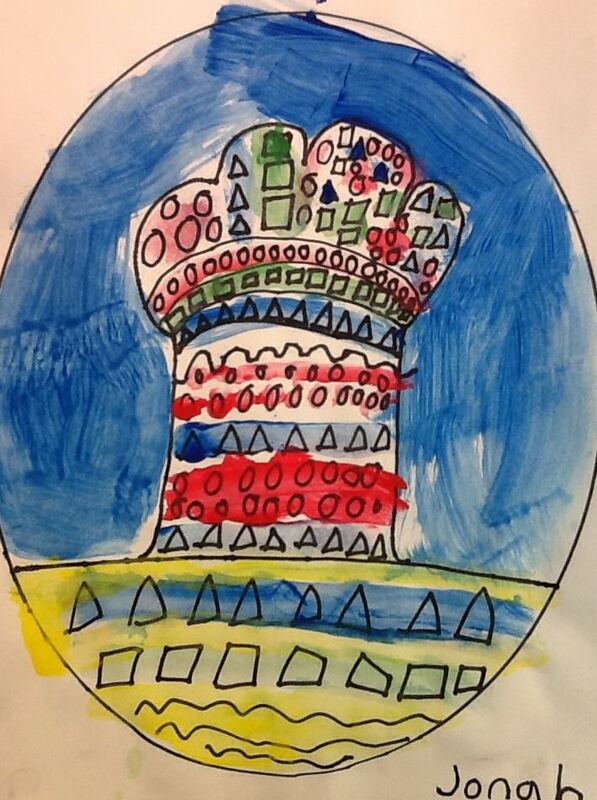 Once that was complete, they were encouraged to fill in their picture with lots of patterns and lines. When they finished drawing, they painted with tempera paint leaving the face white. While we did not have any gold leaf handy, we did have several bottles of sparkly glitter paint (an art room donation) that students could use if they chose to. I have the pleasure of teaching two amazing K/1 combo classes. Many of the students have looped with their teacher. Some of them were at our school for preschool and I worked with them last year. I knew they could follow directions and that they would love to jump right into painting. I liked the idea of masking tape resist and we tried it last year but it was an awful mess with paper ripping and gloppy color mixing. I wanted something that had a bit of that peel and reveal magic, so this is what we did. For this lesson, the students were given a white paper with a sticky note stuck onto it. They were instructed to write their names on the white paper and move the sticky note anywhere they wanted to. I gave them all the same directions-usually I write them down so I remember but today I did not. It is kind of like Simon Says. I saw the activity in a Monart book about 10 years ago. Here is what I told them today. Draw a triangle; any size, anywhere on your paper. Draw a rectangle-any size anywhere on your paper. Draw three circles anywhere on you paper. They may be different sizes, they may be next to each other, it is your choice-you just must have three. Draw two straight lines-they must go off the page but can go any direction. Draw a loopy line that starts on one of your circles and goes off the page. Draw a zigzag line on your paper (forgot that with one class). Once they finished drawing, they painted however they chose to. When dry, we removed the sticky note revealing a “secret” square. Pretty fun how they are all so different. I have taught the same first day lesson for years. This year, I wanted to change things a bit so I introduced the students to Gutav Klimt in addition to my normal speech about elements of art and the different types of lines we can draw. 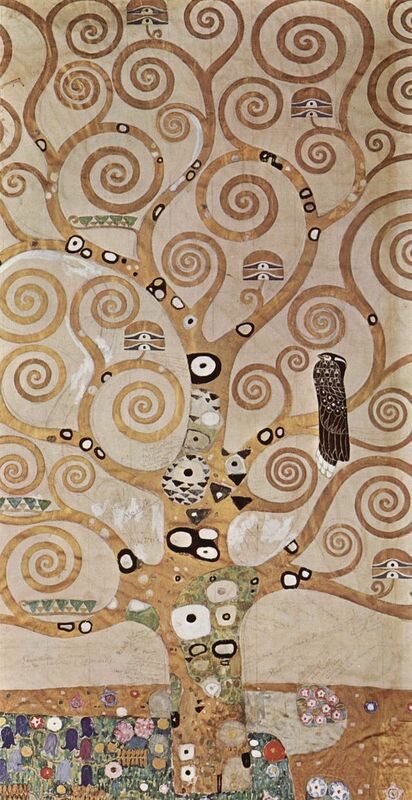 They were shown Gustav Klimt’s Tree of Life painting and given a paper with an oval border already drawn. I showed them several different ways to draw trees. I told them their art should not look like their neighbors. There were three requirements: a tree trunk, the leaves or canopy of the tree, and a horizon line to show the ground. They of course needed shapes, and lines to create patterns. They could paint their trees however they chose to. I am not sure when I first stumbled upon Lulie Wallace’s art but her work is bright and cheery and has lots of patterns and lines. I thought it would be a good first project for 3rd grade. I have 4 third grade classes that come to see me. Because this lesson was new for them and for me, I found I needed to change and adjust it after each group to get a more finished result. I asked them to focus on pattern and line. 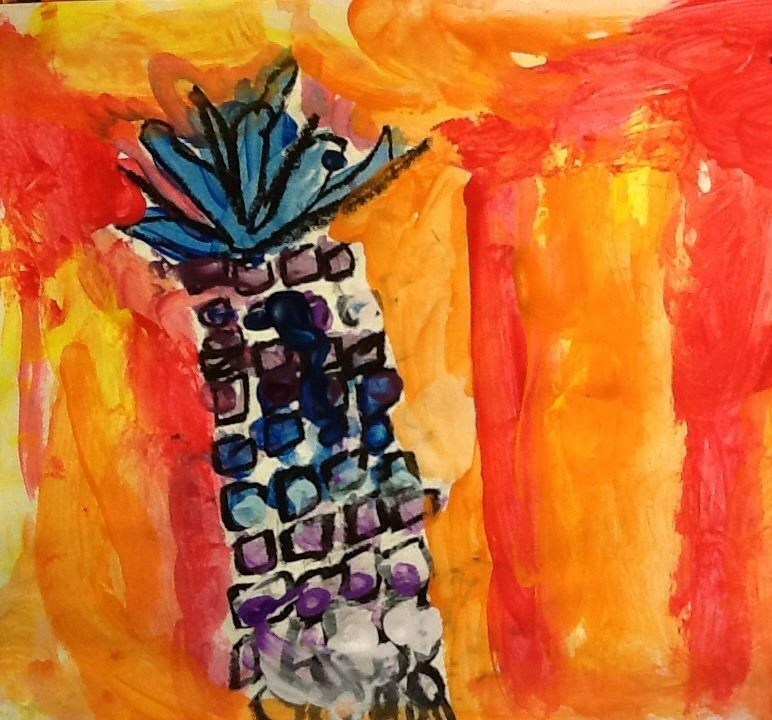 We used tempera paint and oil pastel. They always enjoy the magic of a crayon or oil pastel resist and today was no different. 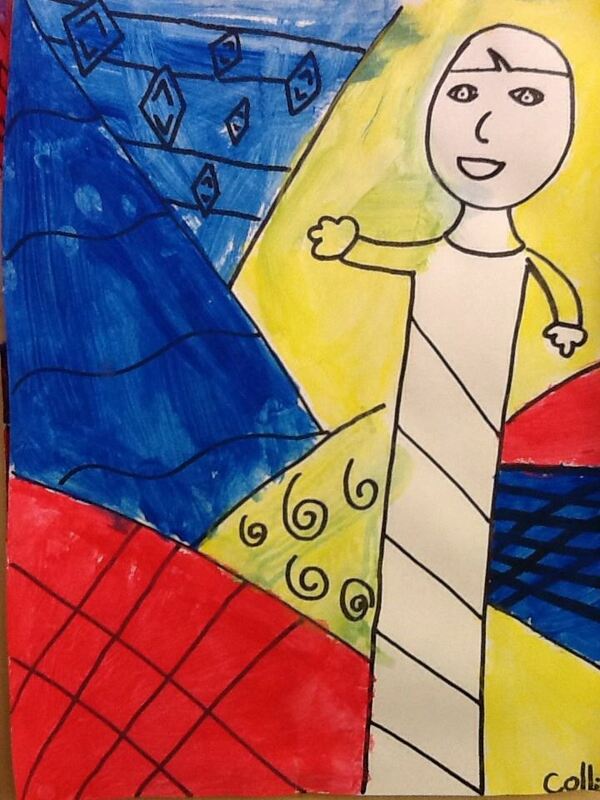 Several students used white pastel in the sky so they could have patterns pop through from underneath the paint. What I learned for this lesson was that it was easiest for them to go straight to paint and use small brushes. Drawing in pencil first seemed to limit them-I did that with the first class but abandoned it when they spent so much time on the drawing that they ran out of painting time. 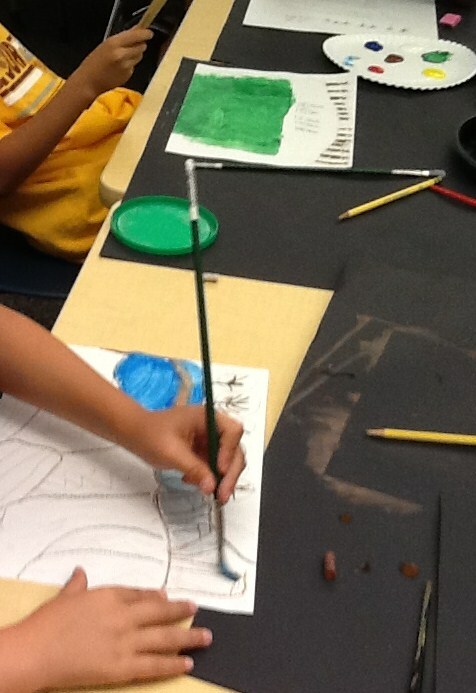 What worked best was to draw a horizon line in oil pastel then create sections below that to fill in with paint patterns. Our grade 4 students learn about early explorers as part of their social studies curriculum. 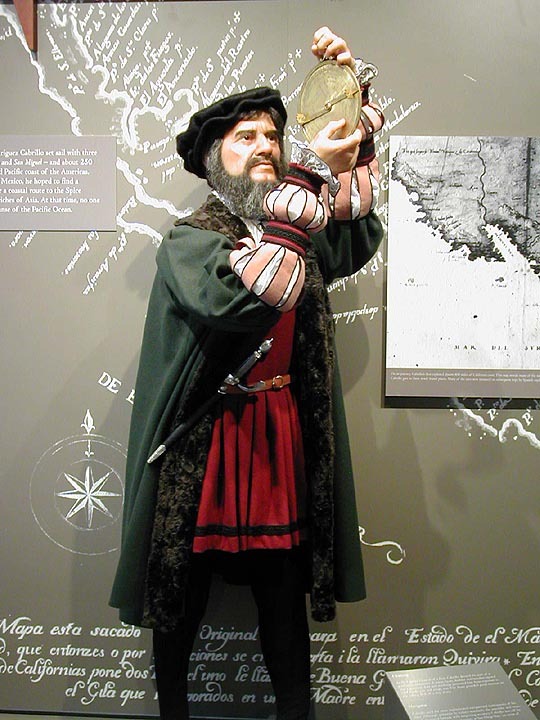 For this lesson, we discussed Juan Cabrillo and his discovery of San Diego in 1542. 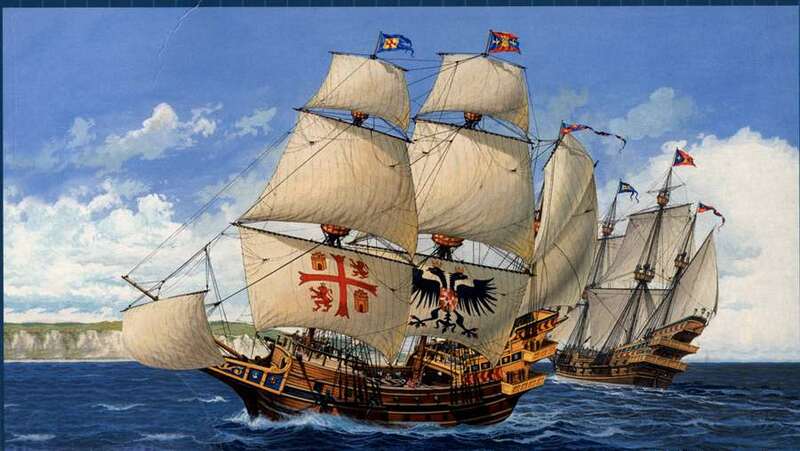 I showed the students pictures of Spanish Galleons and we discuss their size and what they were used for-exploration and war. As well as things that were transported in them, where the captain would stay, the kinds of jobs they had. We also talk about a ship’s ballast as we have a location here called Ballast Point that once had a lighthouse and was the location that Cabrillo stopped at when he discovered San Diego. One favorite fact is that if they transported four legged animals, those animals would often be in slings so they didn’t break their legs. They laugh when they learn that the ships were slow and that a person could walk about as fast as the ship could sail. Students are impressed by the size of these ships. For a large galleon, they could use up to 200 oak trees and the weight is the equivalent of 2 jumbo jets. Whew! The students painted these images in tempera. Some painted the water first, others chose to paint the ship and then the water. The requirements: galleon shape with 3 masts and a bowsprit, crow’s nest optional. No white paper showing unless it is the sail. Could be sunset, mid day or stormy weather. I love that they are all so different. Great job 4th graders! One of the best parts of the day was when one student took her water cup and put it into the sponge tray making the water less susceptible to spillage. I LOVE when kids come up with brilliant new ways to do things. Now why didn’t I think of that?